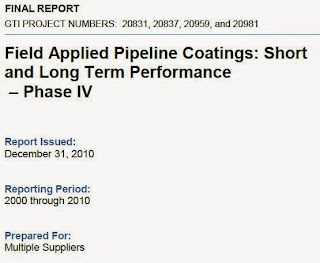 Heat shrinkable sleeves have been used for many years as the primary corrosion coating for field joints (also called girth welds) on pipelines. Do you need a refresher on what girth welds and field joints are? As I've documented elsewhere in this blog (WPCT use history) Raychem (now called Covalence) shrink sleeves have been the market leaders for decades. 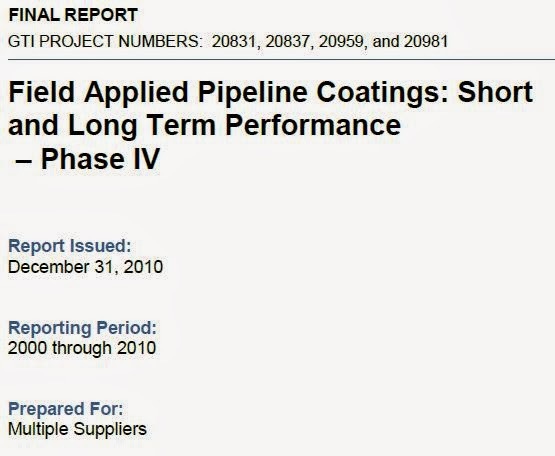 There are very literally millions and millions of pipeline field joints coated with heat shrink sleeves and the truth (which some big spending, vocal spin doctors don't want you to know) is that heat shrinkable sleeves (Raychem in particular) have been incredibly reliable pipeline coatings. Heat shrink sleeves have offered excellent corrosion prevention to pipelines of all sizes. If you've seen the GTI field joint coating test results - then you know that what I'm saying is true. Heat shrink sleeves were generally ranked #1 (tied with FBE) in both clay and sandy soil. Yes, you read that correctly: NUMBER 1. Compare the equipment and labor costs of putting FBE on your pipeline field joints with the material and labor cost of putting a heat shrink sleeve on your field joint....then go read the GTI report....then go ask your buyers why you've been needlessly spending on field joint coating to the tune of hundreds of thousands of dollars per year. I know what you're thinking if you've read this thread. You're thinking "WHAT? That can't be!" I hate to break it to you, my friend...but it is true. It is true - and its proven. In case after case in that GTI study heat shrink sleeves ranked #1 and showed no signs of corrosion. Meanwhile other "technologies" (I put the word technologies in quotes because some manufacturers out there are actually a lot better at marketing and story telling than they are at manufacturing quality pipeline coatings) performed so poorly in that GTI test that it is hard to understand how they sell anything! But, I guess we've all known that advertising works -- that marketing works -- that if we hear something enough - we'll begin to believe it. I think it was Lenin (the Russian; not the Beatle) who said "a lie told often enough becomes the truth."